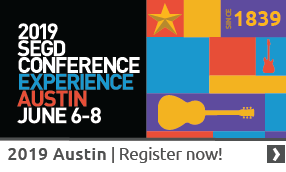 SEGD’s Education programs include conferences, workshops, webinars and courses spanning a wide swath of design practice areas, including branded environments, exhibition and experience design, technology and interactive experiences, user experience, healthcare, practice and technical topics, wayfinding, accessibility, and the business of design. SEGD publications, including the academic journal Communication + Place, the SEGD Annual, and white papers published on topics including accessibility and sustainability, also advance SEGD's educational mission. In addition to its professional development initiatives, SEGD also focuses on academic education, actively collaborating with and providing outreach to design programs at internationally recognized colleges and universities. Design education is currently in a revisionary state, having identified the need to better reflect the rapid shifts occurring in practice and technology-based advances over the last decade. Design programs with roots in graphic and digital design, industrial design, architecture, and interior design have revisited and continue to redefine curriculum to better prepare students for multidisciplinary collaboration, global and social problem solving, and an evolution to designing for experiences, while focusing on foundational and core skill sets essential for emerging designers to fully navigate the spectrum of design challenges that exist at different scales while being able to effectively apply the fundamentals of form, functionality, aesthetics, and sustainability. At the 2009 Academic Summit sample EGD course syllabi and curriculum were presented as a baseline for any institution looking to develop EGD courses to use. These materials can be found on the EGD Course Curriculum page. Additional resources including a listing of EGD/XGD Books that can be used in courses and EGD Core Competencies that should be used when developing outcomes for EGD/XGD centric curriculum. These resources are available under the Academic Resources section of the Education + Research page. SEGD strives to advocate for the value of EGD thinking as an extension of foundational graphic, interactive, and media centric curriculum. As the built environment continues to include rich and connective experiences that tell stories, provide information, entertain and delight users, designers will have more opportunities to work in this rapidly expanding practice space. Our role is also to serve a liaison between both design educators looking for guidance on how to integrate EGD thinking into their existing curriculum and practitioners looking to connect and understand how emerging design professionals and recent graduates will be prepared to respond to the process and challenges that contemporary practice entails. SEGD’s signature academic education event is held annually at the SEGD Academic Summit, which occurs at the annual SEGD Conference each June. The summit provides an opportunity for design educations from around the world to submit papers for possible presentation and inclusion in SEGD’s peer-reviewed research journal Communication + Place. Communication + Place is published electronically on an annual basis, and is a platform for both academic researchers to disseminate their creative work, models for innovation in curriculum, and best practices for research related to experiential graphic design. Many design educators are creating interdisciplinary and hybrid programs that blend the traditionally siloed disciplines of interior, graphic, and interaction design into new and unique course offerings that aligned to the model of a modern XGD (Experiential Graphic Design) practice. You can find some of these in recent papers published in Communication + Place. We look forward to engaging you in our education programs. If you would like to become involved as a speaker or connector within our community, contact Justin Molloy, Director of Education and Professional Development.